To me, nothing says America like bad math – something we’ve seen all too often lately! We had a good game tonight – will we keep it up in Final? If Jess doubles her score, she’ll have 30,800. 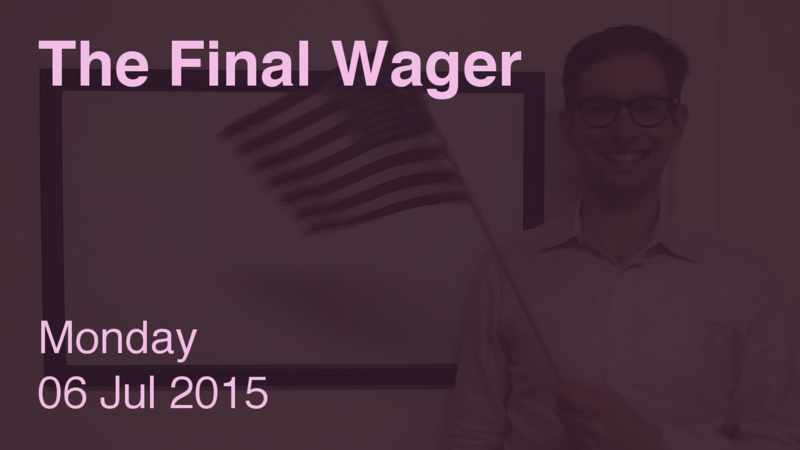 To cover this all-in wager, Hilary will need to wager 13,000. An incorrect response with that wager will leave Hilary with 4,800. To stay above her total, Jess can wager up to 10,600. Shu-Ping can wager up to 6,600. A successful doubling will put Shu-Ping at 22,800. To cover this, Jess should wager at least 7,400. Hilary would need to wager at least 5,000, but leaves herself prone to getting overtaken by Jess. If Jess is incorrect with that wager, Shu-Ping can wager up to 3,400 to stay above her total. He’d also want to wager 1,400 to cover an incorrect Hilary response. If Jess makes the rational maximum wager of 10,600, Hilary will need to wager 8,200 to cover her. If she’s wrong with that wager, she’ll be left with 9,600. To stay above her, Jess can wager up to 5,800. Shu-Ping may risk up to 1,800. Against Jess, Shu-Ping can wager at most 3,400. With a correct response, he’ll have 14,800. To stay above this, Jess can wager at most 600. If she is correct, Jess will have 16,000. To account for this, Shu-Ping will need to wager at least 4,600. Looks like Shu-Ping was thinking ahead, and predicting that 2,401 wager out of Jess. I’m guessing Hilary made a mistake with the math. Check! Double-check! Triple-check! At first I gave Jess a pink, but I upgraded her to an orange – although the 4,801 wager is probably better in most circumstances, I just don’t see Hilary wagering less than 5,001, particularly against two knowledgeable opponents. Plus that larger range would make Jess fall below Shu-Ping’s pre-Final total. Maybe the 599 wager makes more sense for Jess if she doesn’t want to cover Shu-Ping. Tough call.